Vessel sinks rose in popularity in the early 2000’s and have maintained a steady stream of interest over the past 10 years. 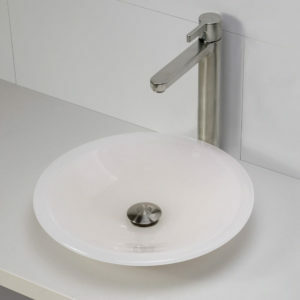 Aerated faucets reduce splash while washing your hands. Avoiding certain materials and colors will reduce (or eliminate) the water spots you’ll see. All-in-one vessel sink and faucet combos do the work for you if you’re having trouble deciding which faucet to pair with your sink. Cleaning around the back and base of the sink can be tricky. Leave enough room between the sink and wall during installation. Consider your countertop height and how tall the sink will be once installed. Too high and it will be uncomfortable. Now, let’s break these points down. One of the complaints with vessel sinks is water splashing. This can be caused by a few different things, such as the height of the faucet relative to the sink or the style of faucet produces a hard stream of water. Even with undermount sinks you get some splashing, and that’s why you often see aerated water faucets used to combat this problem. Aerated faucets insert air bubbles into the stream to reduce the strength of the water flow. 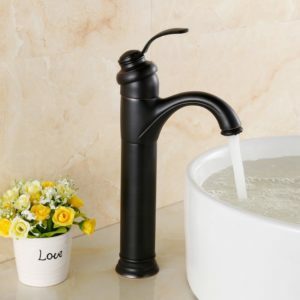 These types of faucets are great for vessel sinks as well. When it comes to colors, people always like to avoid those easily stained colors such as white. With a vessel sink, you’re primarily going to be worried about water stains, or mineral deposits left behind from dried up water. That makes white a very attractive color, especially since it will match just about anything. With that said, one of the common tips for choosing a vessel sink color is to go with something completely different than your toilet. It’s a great way to add more contrast and color to your bathroom. What should you avoid? Clear glass is going to show everything. Whether you are building a new home or just getting started with a remodel, mixing things up with your vanity is an excellent way to add more appeal to your bathroom. Vessel sinks are fairly easy to install since they sit on top of the countertop, but require some planning. This means your sink will be an attention-grabbing feature of the room rather than being essentially out of sight. Vessel sinks add style and flavor that catches the eye by adding distinction to an otherwise flat countertop. Where did the vessel style come from? Washstands date back to the 16th century and their use peaked in the 1800s. Then, as you would expect, their use died out as tap water became widely available. Wash basins are bowls that were kept atop the washstand with a pitcher of water and was used for personal cleaning. The wash basin can be thought of as an early form of the bathroom sink. Eventually, features such as mirrors were added to wash stands and they started growing to accommodate accessories like soap dishes. Thus, the modern vanity was born. So as you can see, the vessel sink is a throwback to a time when running water in your bathroom was available to only the wealthiest (or not at all). Since washstands and basins were popular during the formation of what we now consider ‘classical’ style, the likeness of the vessel sink adds a sense of elegance to a bathroom. If you’re interested in ready more about the origin of the vessel sink, check out this article. 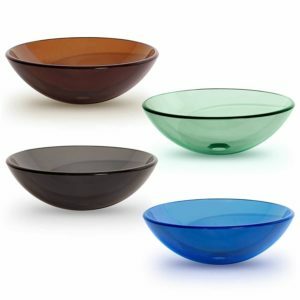 Remember, how the vessel sink stands out rather than sits hidden under your vanity countertop? This means you have another feature to tweak that can bring color and texture to your bathroom’s design. It’s unnecessary to keep the same color sink, toilet, and shower/tub like most designs traditionally do with undermounted sinks. You’re already breaking out of that mold by considering a vessel sink, so why stop there? Still, you will want to coordinate the colors and texture of the sink with the overall design. For example, a white toilet and tub (which most people have) will coordinate with any vessel sink. However, if you have custom tiling, wallpaper, or colored walls, then you will want to think about how the sink will match. Maybe you’re remodeling and trying to nail down your wall color. Walls are easy to paint over, but swapping out a sink is more costly. The current trend is to have the vessel sink not exactly match the other fixtures in your bathroom. This draws attention and is a way to make the sink an even more stand-out feature of your bathroom. If this is what you have in mind, consider a more exotic textured material like hammered copper, teak wood, or marble. Paint and curtains can be changed easier than fixtures, so don’t decide on one without considering the other! You also may prefer a more neutral color scheme for marketability and future proofing. There are some great examples out there if you’re still undecided on a color scheme. Check out these beautiful bathrooms over at HouseBeautiful.com or Better Homes & Gardens. 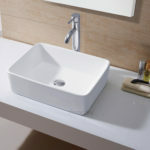 If you’re remodeling and keeping the same vanity, then you will need to pick a vessel sink that either works with your current plumbing setup or be willing to redo some piping. For new construction or complete remodels, you will have more freedom and be able to pick a vessel sink then plan the proper plumbing. Vessel sinks sit on top of the vanity countertop, so the counter height generally should be lower than with an undermount sink. Since the vessel sink is tall, children may have trouble reaching it and will need a stool. The good thing is they grow up, eventually! Making the vessel sink the focal point is key, so consider a countertop that doesn’t distract from it and instead lets it stand out. To avoid splashing, place the faucet at the recommended distance from the center of the sink. This will vary with each different design of faucet and sink. Most countertops are between 30 and 36 inches tall, and most vessel sinks are 4 to 7 inches tall. 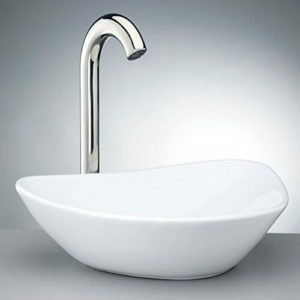 There are many different types of faucets to complement the varied designs of vessel sinks. You could have a counter-mount faucet or wall-mount faucet. Wall-mount faucets will usually be front and center, while counter-mount faucets can be moved around the perimeter of the vessel sink. If your vanity is skinny, then you have the option of having the counter-mount faucet be beside or diagonal to a person standing at the sink. 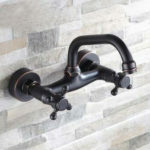 Wall-mount faucets are probably the least common in residential settings, but if you are building a new home or doing a complete remodel then they are an option. One of the worst things you can do when mounting the faucet is to not leave enough room between the sink bottom and faucet. When people go to wash their hands, and they can’t get to the water without touching the sink bowl, it is very unpleasant; especially if you don’t keep your sink clean! Faucet placement is easy to test so just take the time to make sure you wall-mounted faucets are placed at a reasonable height, and you counter-mount faucets are placed the right distance away from the center of the sink as well as being tall enough. Since vessel sinks sit on top of the counter, counter-mount faucets will have long necks and usually are around 12 inches tall! Another type that I haven’t mentioned, the sink-mounted faucets, leave less to think about as there is only one place to mount the faucet. Having a professional install your sink is always recommended for making sure the placement is just right. If you want to guarantee splashing won’t be a problem, look for a faucet with an aerator. This reduces the force and density of the stream coming from the faucet. You often see aerators in restaurant bathrooms. Faucets with aerators will produce a white stream that feels bubbly, whereas non-aerated streams will be clear and feel heavy. Often aerators are removable, so you can test it out and decide which is best for your sink. Click to search for Aerated Vessel Sinks Faucets on Amazon. This is the fun part. With the different practical problems in mind, now you want to find a sink that will make your dream bathroom! I want to try to cover all the different materials here and their pros and cons. If you have something to share about your experience with a certain vessel sink material, please leave a comment below! Huge variety of colors and designs Resistant to scratching, chipping, and impacts. Stain Resistant Bronze forms a natural patina and darkens over time. Copper’s alluring color and natural microbial finish feels luxurious. Nickel is similar to copper in durability and finish. 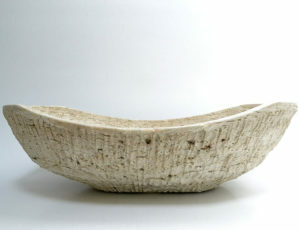 Teak and Petrified wood offer unique designs, No two vessel sinks are exactly the same. Natural stone is a general term for many different types of rock. Natural stone offers the same uniqueness as teak and petrified wood. Stone requires sealing and then periodic resealing. Variety of color and shapes. Scratches can be sanded off and re-polished. The possibilities for shape and color with glass are endless. Glass can be formed in any way you like and can even be given the look of other types of materials listed here such as wood, porcelain, or bronze. It’s also the most common type of vessel sink. It’s lightweight and cheap, but relatively brittle compared to other vessel sink materials. Ceramic, Porcelain, and Vitreous China – What’s the Difference? These are the most common sink materials, but there likely is some confusion as to what makes them different. Let’s start with ceramic and porcelain. Ceramic is a general term for materials made by heating clay in a kiln. Porcelain is a type of ceramic that is heated to a much higher temperature than other ceramics, between 2,200 and 2,600 degrees F. This extreme heat adds strength to porcelain relative to other types of ceramic pottery mainly due to the increased density and bonds that form. Porcelain originated in China and was later exported to Europe. These exported Chinese porcelains were highly regarded, and the word china was used as a synonym for porcelain. Finally, vitreous china refers to the enamel added to porcelain (or other ceramics) to give it a glass-like texture and shine. Vitreous enamel is made with powdered glass that is then heated to form the shinier and more durable coating. Vitreous enamel is also added to ceramics other than porcelain and is very commonly used for toilets and sink basins. But what does all this mean for a vessel sink? Very durable; Can last over 100 years. Susceptible to stains. Keeping soap scum and toothpaste deposits off your porcelain sink is important. Porcelain can chip if you drop heavy or sharp items into it. Resistant to chemicals and thermal change, but highly acidic cleaners (vinegar) can damage enamel. Can be made into any color you like. Porcelain has been used for centuries, and there are 100-year-old porcelain sinks still in use today. With that said, it is not malleable like metals and doesn’t hold up to very hard and sharp force, so dropping heavy objects on it can cause chipping. Porcelain is usually coated with a vitreous enamel containing glass and/or metal. The enamel can be made into any color you like, so you have a lot of freedom for matching up or mixing up your vessel sink color. Porcelain has a soft and shiny appearance, and due to the glass-like coating, is easy to keep clean. It is important to not use abrasive sponges or cloth. The glass-like enamel can lose its soft and sleek texture if you use abrasive cleaning fabrics or chemicals. The sky is the limit when it comes to colors, but you may want to think about what will show stains. The types of things we put down our bathroom sinks, like toothpaste and soap, will stain white. The minerals left over from tap water drying up will also show up white. This means darker colors will show stains more than a white sink, for example. However, there are more options than just a single color! There are many different designs and patterns than are used on porcelain vessel sinks, so finding one that doesn’t show stains so easily, while also adding some flare, is possible. Less durable than Porcelain in terms of impact forces. Resistant to chemicals, but acidic cleaners (vinegar) can damage enamel. Can be made with any color you like. Essentially everything about Porcelain sinks can be said about Ceramic, except Ceramic is slightly less durable. Visually you can’t tell a difference since they are both can be coated with the same type of enamel. As for color options, you can have anything you like. Vitreous enamel normally has a soft, glass-like appearance. Depending on the color you choose, you may notice soap scum and toothpaste deposits more. A white sink doesn’t show stains from the type of things we typically put in a bathroom sink, so it is a safe option. Dark colors like blue or black will show stains from soap or the minerals in tap water. Alloys like Stainless Steel or Bronze are commonly used for vessel sinks and have more durability than porcelain or glass. First off, there are so many options when it comes to metal vessel sinks. You can be sure to find a style and color that adds alluring color and texture to your bathroom’s style. Resistant to corrosion and is naturally an antimicrobial material. Can flex under heavy forces and not cause permanent damage. More resilient than glass or porcelain. Alluring color and finish that feels luxurious. Metals that form a patina, like bronze or copper, will naturally change to a darker color over time. This adds an aged and rustic look to the vessel sink. Depending on the amount of care you put into your sink you may want to polish bronze to maintain a gold-like finish. It’s really up to you and the style you’re going after. Bronze is an alloy consisting of various metals but is primarily made of copper. It will be more resilient than plain copper. There are many different types of bronze: polished, white, weathered, satin, patina, and hammered. 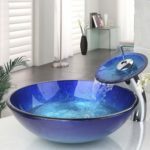 There are also various kinds of copper vessel sinks including hammered, polished, patina. What this really means visually is that you can get that new penny shine or a dark espresso color. Patina or Polished? Hammered or Smooth? The number one consideration is your style preferences. Beyond that, you will want to think about how much work you want to do to maintain your sink’s look. Having a shiny, smooth finish will require polishing and will show scratches that inevitably occur over many years of use. However, a dark patina combined with the hammered texture will give you a much more forgiving an maintenance-free style. Whether you choose bronze or copper, you will still get the same colors and style available for each. Copper is a very soft metal. To give you some perspective, copper is slightly harder than gold, silver, and aluminum but is slightly softer than iron, nickel, and steel. Thickness becomes increasingly important with the softer metals, and are a major factor in the overall toughness of copper or bronze sinks. For vessel sinks, you will want more thickness than if you had bought an undermount or drop-in sink. This is because the vessel sink must stand on its own and the walls of the sink are not supported in any way by the vanity. Copper thickness is measured by a gauge number. The typical range for sinks is between 14 and 18 gauge. The thickest being 14 and thinnest being 18. For a vessel sink, you would prefer to have 14 gauge copper. Nickel looks somewhat like stainless steel, but there’s just something different about the color. Hammered nickel is one of the most popular and beautiful designs available. 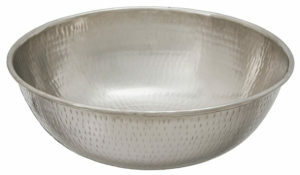 Similar to hammered copper, you get a very luxurious and handcrafted feel from a hammered nickel sink. Nickel does not form a patina and doesn’t require polishing, but polishing nickel will make it brighter. Don’t use abrasive materials (scouring pads) on a nickel sink. Nickel does not form a patina, so polishing isn’t a requirement, but polishing any metal will make it shinier. If you do put household cleaners down the drain, be sure the nickel sink is completely washed out. If you have hard water, you will notice mineral deposits so drying out the sink or wiping it out periodically will help maintain the shiny appearance. Stainless steel is commonly used in place of any metal that might be exposed to moisture or chemicals. Sinks are an obvious choice for stainless steel. 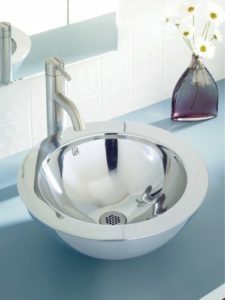 Typically, stainless steel vessel sinks come in a wide variety of shapes and sizes but always have a smooth style. Stainless steel is essentially maintenance free. Like most other sink materials, don’t let highly acidic chemicals remain on the sink surface. Keeping your sink washed out is helpful. If a natural, rustic style is what you have in mind, then wood should be on the top of your list. Wood sinks are a material you simply don’t see in most bathrooms. Teak is the most commonly used wood for vessel sinks and is a moisture-resistant, versatile hardwood. Teak has a high oil content, high tensile strength, and tight grain which have made it ideal for purposes that require weather resistance. Boat decks, outdoor furniture, and even boats themselves. Teak has been used to build boats for over 2000 years. Teak isn’t the only wood used for vessel sinks; you also have bamboo and petrified wood. Bamboo is one of the fastest-growing plants in the world and is one of the most eco-friendly materials you can use. It replenishes itself much like grass, which is much faster than any other type of tree. Petrified wood sinks offer the most unique and exotic look. No petrified wood vessel sink will look like another. They are truly one-of-a-kind. Taking care of your wood vessel sink is simple. Don’t use harsh chemicals and don’t dispose of acidic chemicals using your wooden sink. Do not clean your wooden sink with vinegar, even though this is a fairly common ‘natural’ cleaner. The acidity of vinegar is bad for wood finishes. As with any material coated with enamel, do not use abrasive (scouring) material to clean your sink. The same is true for copper, bronze, or porcelain. Natural stone is similar to petrified or teak wood as a sink material because of the uniqueness of each sink. No two sinks are the same. Each stone was pulled from the ground and retains its unique color, shape, veining, and mixture of other materials such as copper, silver, or gold. The style of stone sinks can range from rough and natural to as shiny and slick as a porcelain vessel sink. There are many different types of stone used for vessel sinks, so many that I’m probably not listing them all here. Natural stone requires a bit more work than other vessel sink materials, but I feel the uniqueness and natural beauty they bring to a bathroom is unmatched. That makes it worth the trouble. Honestly, it’s really not that bad. Stone is porous, for the most part, and you will want to be extra careful to protect it from harmful substances. The first thing you should do with a stone sink is seal it, then reseal it once or twice a year. Regularly cleaning your stone sink with a mild detergent is recommended. Do not allow mineral deposits such as salt, lime, soap, or iron build up on your sink. If you have hard water, it is recommended that you wipe out the sink frequently to prevent the buildup of minerals from your water. Resin is a man-made, stone-like material that can be cast into any shape or size. Polyresin is typically used to make statues, figurines, decorative furniture, and vessel sinks. Resin can come from many different substances such as plants, fossils, insects, and petroleum. Resin is nonporous and resistant to stains and scratches. Similar to most other materials, wiping out the sink is recommended to remove water stains. Using a mild detergent is safe for cleaning, and avoiding acids or abrasive materials is recommended. If your resin sink gets scratched, it is possible to repair it. Using course grit sandpaper, rub in small circular motions until the scratch is gone. Then use a fine grit sandpaper to smooth over the previously sanded area. Then use a polish compound like what’s used for automobiles. This may not be recommended for resin sinks with designs or patterns than can be damaged from sanding, so be sure to check with the manufacturer. Clean4Happy is dedicated to finding the best tools for the job and presenting that information quickly and clearly. When readers click our links, we earn affiliate commissions that support our work. Clean4Happy is a participant in the Amazon Services LLC Associates Program, an affiliate advertising program designed to provide a means for sites to earn advertising fees by advertising and linking to Amazon.com.